Karisma Records are set to release a digital single from Prog Rockers AIRBAG on the 5th of September in advance of the scheduled October 17 release of the band’s sophomore album “All Rights Removed”. The single, “Homesick (Part I)”, is a special edit of the closing track from “All Rights Removed”, and will be available from all the usual digital distributors. Formed in Oslo, Norway, in 2005, AIRBAG, whose line up includes front man Asle Tostrup, Bjørn Riis on guitars and vocals, Jørgen Hagen on keyboards, Henrik Fossum on drums and Anders Hovdan on bass, has created its own unique sound by taking elements from classic and progressive rock, chill and jazz, and melded them into what Classical Rock Magazine described as “prog at its most chilled, honeyed and soothing”. Since AIRBAG’s inception, the band has continued to expand its stage performances, with strong visuals and the extensive use of backdrop film to underline the music. 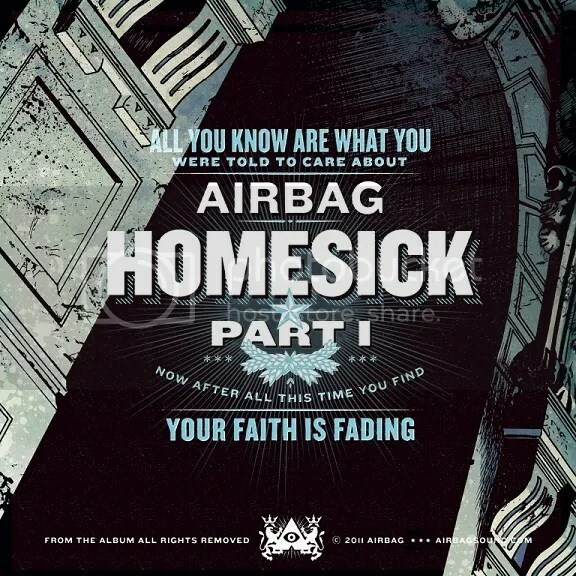 AIRBAG’s first album “Identity” was released on Karisma Records in 2009, and was hailed as one of the best progressive releases of that year. The upcoming second album, “All Rights Removed”, sees AIRBAG take a more conceptual direction, with long, epic pieces and dramatic instrumentation. It is very much the product of a strong collaboration within the band that focuses on both the lyrics and the music, and has taken almost two years to write, record and produce, and the result is a massive sound and stronger than ever musical performances. Below you can see the official video of AIRBAG playing “Homesick (Part I)” live at a recent concert in Oslo. Very good this band! Good sound! i’m from Poland so I dont speak English quite great, but this post is really good.